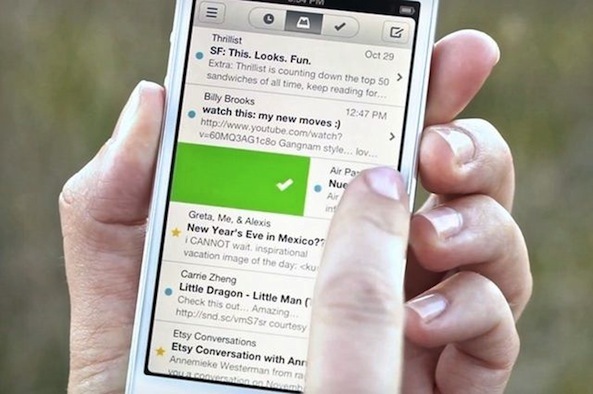 Since its announcement, Mailbox has been something of a rockstar among app fans. If you haven’t been rabidly following it, Mailbox is an app that allows you to finally gain control of your overloaded Gmail accounts (other e-mail services will be compatible soon). Upon first glance the app doesn’t appear to differ wildly from the usual e-mail inbox apps, both first party and otherwise, as it streams your usual e-mail inbox to the app,and presents the messages in a clear and defined, yet traditional format. There’s nothing mind blowing here yet, as it’s just your e-mail inbox. It’s the interactions available with these messages that makes Mailbox such a hyped app, most of which revolve around sliding a message right or left. Sliding a message quickly to the right, for instance, will archive the message, while a slow swipe to the right will delete it. Swiping shortly to the left, however, lets you put a message on hold from times ranging from hours later to the vague “someday.” A longer left swipe lets you save the message in special categories such as “To Buy”, “To Watch”, and more. You can even create your own custom categories which are, along with your archives and other specific inboxes, fully searchable and available to view independently through tabs atop the app. There are various other functions of the app including e-mail notification and organizing e-mail chains into readable chat like formats, but the general function of the app is making it as easy as possible to get your inbox to zero (it even celebrates an empty inbox, with a logoed message). It’s designed for people with high e-mail volume in mind, but even the casual e-mail user has to appreciate the combination of fluidity and depth presented by Mailbox, allowing you to not only do more with your inbox than ever before, but do it easier as well. While a few features shy of its full potential, for Gmail users, Mailbox is in fact the absolute best mobile mail manager ever created. While the developer’s tagline of “you’ll wonder how you lived without it” is as cliché as it comes, it also happens to be the absolute truth here. You’ve never seen an app that allows you to so smoothly and thoroughly handle your messages, and you may very well never need another app to do so. There’s a sizeable waiting list to download Mailbox at the moment (which is admittedly kind of absurd) , but you shouldn’t hesitate to jump in line, as with a few updates, this might just become the most used app of the year, and is certainly my app of the week.